The Hawai’i Isle Police Activities League program (HI-PAL) has concluded its Boys and Girls Intermediate School Spring Basketball League. League play began March 10 and ended May 13. Ten intermediate school teams (four from Waiākea, two from Hilo, one from St. Joseph, one from Pāhoa, one from Haili Christian and one from Laupāhoehoe) played a total of 56 games with participants from 6th, 7th and 8th grades. The games were played at Andrews Gym, Honomū Gym and the Hilo Armory. On May 13, the league concluded with two semi-final games and a championship game played at Andrews Gym. The team coming out on top was “Team Happy,” with with players representing Waiākea Intermediate and Kamehameha Schools. 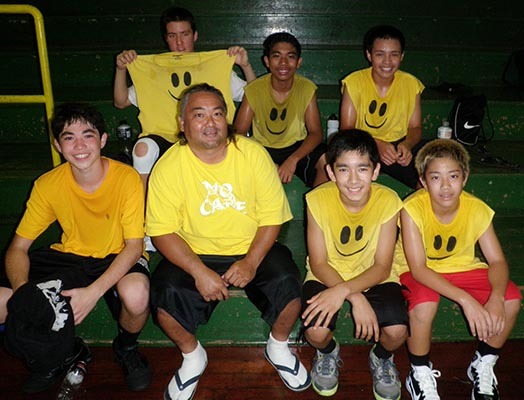 Depicted in the photo above are the team’s coach, Guy Nakamoto, and team members (in alphabetical order): Tony Dollwet, Bryce Felipe, Dylen Ita, Micah Kanehailua, Tolby Saito and Xylen Takata. HI-PAL would like to thank the Hawai’i County Department of Parks & Recreation for its continued support. Parks & Recreation’s assistance in allowing for the use of its facilities has allowed HI-PAL to reach out to more than 100 youths and provide them with activity in a safe environment. For more information about these events, all interested coaches are encouraged to call HI-PAL’s East Hawai’i coordinator, Officer Joseph Botelho Jr., at 961-2220; HI-PAL’s West Hawai’i coordinator, Officer Randy Morris, at 326-4646, Ext. 258, or 323-2123; or the Community Policing Office at 961-8121. FAXes may be sent to the HI-PAL office at 961-2209 or the Community Policing office at 933-4000.